It’s been a while since I’ve updated my blog. I’d like to say it’s because I was busy feeding the hungry, laying hands on the sick, building homes for the homeless, traveling overseas and spreading the gospel, moving and shaking my city for the name of Jesus. Of course, I’d love to say those things, but then I’d be a liar. I was actually in the middle of a transitional season with God. It may be more accurate to say I was in the middle of a transitional season with doubt, fear, intimidation, insecurity, complacency and laziness. This is not to say God wasn’t present and showing Himself mightily to me during this summer, but these other obstacles were also in my line of sight. I’ve known I was created to write for God for years. I’ve never once questioned my destiny or God’s purpose for my life. I did, however, begin to question my ability to be great in the call. Rather than singing God’s grace and dreams over my life, I quickly sank into self-doubt and intimidation. There wasn’t a particular person or writing style that intimidated me; the call itself caused me to quiver in my boots. This occurred because I measured the frailty in my humanity against the spectacular call that God set before me. In my eyes, I looked at what He desired from me and thought that it would take my own strength to perform it, when all He wanted was the opportunity to use me for His glory. He would be doing the work. This reminds me of Moses, the murderous, adopted son of Pharaoh turned shepherd, who would have benefitted from a few anger management sessions with Dr. Phil. God gave Moses a call that was much bigger than his own perceived ability. God calls a murderer to be the deliverer. What was Moses’ response to God? “Who am I that I should go to Pharaoh and bring the children of Israel out of Egypt?” God says, “But I will be with you…” So begins the verbal exchange of Moses’ excuses and God’s affirmations (recorded in Exodus chapters 3 and 4). Moses: Who will I say sent me? God: I AM THAT I AM! Moses: But, they won’t believe me. God: I will perform signs through you. Moses: But, I’m not eloquent. I can’t speak well. God: I will be your mouth and teach you what you will speak. 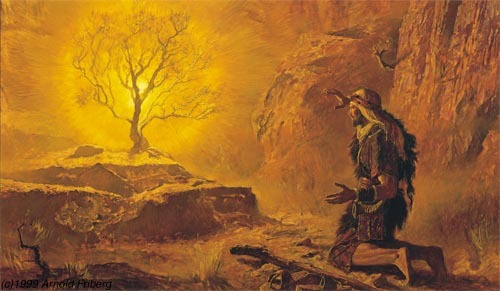 Moses: Oh, my Lord, please send someone else. Reading this conversation makes Moses seem faithless and weak. We would never be this way with God, right? How many times have our own prayers facilitated conversations like this with God? How many times have we questioned God’s confidence in us? How many times have we tried to tell the omniscient, preeminent, omnipotent, supreme, Almighty God of all that He is wrong in His choice to use us for His divine purposes? How silly are we to shake our fists at God’s call on our lives! I have been much like Moses. I’ve looked at the call on my life along with my own weak abilities, and shrunk in fear. Fear fueled my intimidation and doubt. Fear chased away faith in God. Fear caused me to forget that the same God who called me is the same God who will walk with me every step of the way until I fulfill the call. In fact, God is the one doing the work; I am simply the vessel the source of Life flows through. God’s love and mercy are so rich, in that even when we doubt our own gifts and capabilities, He is sure. He could have easily said, “You know what, Mo, you’re right. Maybe you’re not the guy for the job.” No, God was sure of His choice in Moses. He didn’t even allow Moses’ speech impediment or insecurity excuse Moses from the call. God told Moses, “[Aaron] shall speak for you to the people, and he shall be your mouth, and you shall be as God to him.” Talk about a promotion from murderous, has-been son of an evil Pharaoh! The point of the matter is that everyone who is in Christ is God-designed and has a purpose in Him. We all have a call of greatness over our lives. The amazing truth is that God is aware of our defects, issues, and inadequacies when He calls us, yet He calls us anyway. I’d venture to say that our fragility is the reason why God uses us because we cannot possibly take the credit for the glory which will be done through us. People will take one look at us and know that God has been with us. I choose to shake off every thought of defeat, and trust in the One who called me. God doesn’t need a reminder of why we’re not qualified, or a list of excuses. He needs a ready and pliable vessel. God didn’t have to use Moses (or any man, for that matter) to deliver His people from Egypt. With one blow from His nostrils, the Egyptians could have fallen dead, yielding instant freedom from captivity for the children of Israel. God doesn’t really need the help of man in anything, yet He intentionally chose Moses. Why? The purpose of the call includes more than the goal of impacting people for the glory of God. The call is an avenue for I AM to intimately connect with you in a way you’ve never dreamed of.